Delish is a new part of KYW where every fortnight I am going to write an extremely honest restaurant review. The good, the bad and the ugly of the experience. Some of these places I have been going to forever some will be new experiences. All the restaurants will range in price. I will share that too. Todays restaurant review is Sake. I have been going to Sake for over 5 years and the food is consistently good, I actually forgot how good so I hadn't been for a while. Sokyo was my favourite Japanese until last night. Sake came in and blazed it up!! I made a booking same day for a 7.30pm Sunday. They got us in without a worry. I have tried to book on other occasions for a Friday/Saturday and they are fully booked way in advance so make sure you book with plenty of time if you want either of those days. We arrived and sat at the bar for a pre drink, I ordered a vodka, soda and lime with a splash of cranberry and it was delish! The servers are very attentive in the 5 minutes I had arrived (and was already in deep dramatic conversation with my friends) I was asked by three different waiters if I wanted a drink. It is important by their standards to have your thirst quenched. Thumbs up in my book! I know this is weird but before I head to restaurants I get my self excited by reviewing the menu. By the time I got to Sake I knew exactly what we needed. Bless my friends they trust my ordering skills so they let me do what I do best! Believe me if ordering the perfect selections of food to please everyones taste buds was a profession I would be a millionaire! They were all incredible, the perfect mix of flavours, salty, spicy and tart. The winner was the Kingfish and the Ceviche. The snapper was lovely and delicate but the flavour was lost in the explosion of the other two dishes. I then ordered us the *Sashimi Taco's. The waiter did warn me that they are "gimmicky" but I insisted and after the sashimi it was average in comparison. The crunch really complimented the sashimi but generally the flavour was bland. To be honest I am trying to find fault, which is hard. Everything is incredible at Sake and we devoured the taco's and the sugar rimmed sake shot (a play on what would be tequila) it was beautifully presented dish just a tad bland. I then ordered one of the stand outs of the night which had to be re ordered it was soooo good. 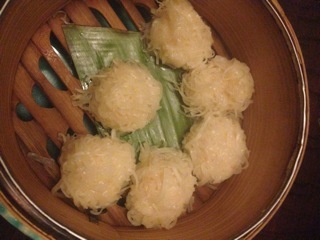 *Steamed prawn dumplings: 6 pieces of chinese-inspired shumai with spicy ponzu - I am a dumpling fiend and these are possibly the best dumplings I have had in the whole world!!!! YES I SAID IT! *Nasu dengaku( grilled eggplant with light and dark miso pastes) was delicious. My friends encouraged me to eat the skin and I didn't enjoy that as much as when I just scooped out the juicy, miso eggplant. The flavours were magic! *Glacier 51 toothfish lettuce cups: 4 pieces of grilled miso-marinated toothfish in lettuce cups another winner. I had never ordered this dish and it was on par with how good the dumplings were. The presentation is gorgeous, miniature lettuce leave envelope tender, sweet and creamy pieces of tooth fish (I had never heard of this type of fish either) I love me some Miso cod and this was just as gorgeous! 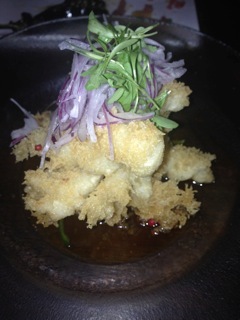 *Scampi tempura with sweet ponzu, coriander & jalapeño slices was by far the stand out. It left us all in awe and gratitude that something could be created with such perfection. The tempura is light and crispy and doesn't swamp the delicate tender and sweet scampi. The serving was generous too. We were all a little bit like hyenas on a carcass with that dish. *Spicy tuna: crispy rice spicy tuna tartar on crispy rice fingers. Ok I lied! This was the standout!!! I have an obsession with this dish. I came across it in LA where it is served everywhere. In Sydney I only know of Sokyo (which is why it was my favourite before) and then last night for the first time at Sake! I couldn't believe my luck. The dish is for the set menu usually but I had asked if it was possible to order a morsel each. The waiter who went above and beyond for us made it happen! I was so so incredibly happy. It was better than I had ever had it. The time and preparation that goes into this dish is extensive but then it's devoured in a mere mouthful or two. The rice is crispy yet chewy on the inside and the tuna is the perfect choice of fish its a match made in Japanese heaven. *Scampi Miso came right at the end it was ok, lovely pieces of scampi but the miso was a little dense for me. I have to be honest I was very full at this point too. I probably would order regular miso next time. Now I am putting it out there I am not into desserts. I would do a cheese platter over a dessert any day but I always make sure there is a spare spoon for me just in case. We ordered the White chocolate green tea kit kat dessert. I am not sure how to describe it as I can't find it on the menu but it is light, crispy, with a white chocolate ganache and a chewy chocolate super thin wafer which was beyond! I don't go for desserts but this was next level. I was also cheeky and ordered the Miso Caramel's from the Desert Bento to try they really ended the meal with the perfected little punctuation point. The meal was to die for! We paid $100 p/head including tip. I have already planned my next trip back. Sake is now in as my first choice Japanese in Sydney.